We all know the fact that chocolate and love both go hand in hand. When it comes to expressing your true love to your special one, giving chocolate day gifts always wins the game. So, this Chocolate Day, spoil them in your love chocolaty. You would agree with me when we say that nothing expresses the sweetness of love better than chocolates. Love is such a divine feeling and it is most appropriately matched by the melting taste of chocolate in the mouth. The special day when we celebrate our love, Valentine's Day is the perfect day for gifting chocolates to the one you love. Valentine's celebrations go on for a week and one of the special days is the chocolate day when it is the time to exchange sweetness. Go ahead and send Valentine chocolate to that most special one in your life. FlowerAura is the most capable partner you can trust upon, to deliver your love wrapped in chocolate gifts for Valentine's day. With an alluring range of chocolate gift hampers specially crafted for this special day, we are all set to spread the love for this Valentine season with the option to send Valentines day special chocolate box online ordered from FlowerAura. Chocolate is one thing that only a few numbers of people can actually resist and they know how hard it is to stay away from the temptation. No wonder this food is rightly termed as the Original Sin. The dark sensation is so much popular worldwide that we actually celebrate the chocolate day with all the zeal and happiness. Chocolate makes one of the best valentine's day gifts online which can easily enlighten the mood of your loved one. With the sky-rocketing advancement of online technology, sending a chocolate day gift has become a cake walk. You can simply order luscious chocolate online from FlowerAura's store, make the payment and you are simply done as this store will send the handmade chocolate box or chocolate bouquet for valentine's day consisting of all the tempting flavors such as almond-rich dark chocolate, mint, caramel infused chocolate gift to any given address in your city. FlowerAura provides the best chocolate for valentine's day with completely free shipping across India. The special express delivery offered by this online store ensures that your loved one will receive the Valentine's day chocolate delivery in India in a very prompt manner. No matter what type of delicious chocolate you want to gift to your special one, just name it and this online store has it for you. 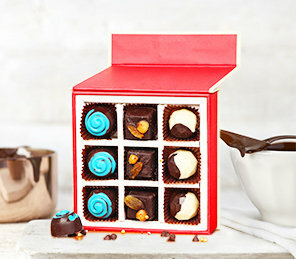 We create visually appealing and the most scrumptious chocolate hampers for this day. Our handmade chocolates are among the best chocolate day gift ideas. We make sure we use the best chocolates for valentines day. We deliver chocolates within the same day to your loved ones. We avail the facility to couple the chocolate gift with flowers, cakes, personlised gifts, hampers, etc. Our collection consists of Valentine Chocolate gifts for him too. Your utmost concerns when you want to send Valentines day chocolates are the payment hassles, how to make a choice, midnight delivery, and the price affordability. Do not worry at all. Everything is taken care of, only at FlowerAura. Once you reach out to us through phone or our online web platform, you will be spoilt for many choices. Choose Valentine gifts for girlfriend online from the artistically designed chocolate hampers such as "Chocolicious Basket", "Rosy Teddy Rocher", "Cuddly Choco Bag", "Golden Toblerone" and many more, to pamper your girlfriend, boyfriend, wife or husband for the very special day.